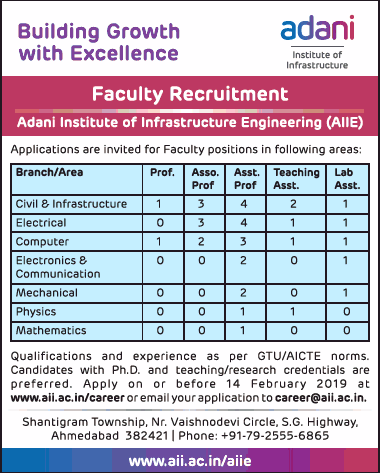 Adani Institute of Infrastructure Engineering, Ahmedabad has advertised in THE TIMES OF INDIA newspaper for recruitment of Professor / Associate Professor / Assistant Professor / Teaching Assistant Plus Lab Assistant jobs vacancies. Interested and eligible job aspirants are requested to apply on or before 12th February 2019. Check out further more details below. About College: Adani Institute of Infrastructure Engineering (AIIE) is established to equip the students to become modern day engineers and managers primarily for the infrastructure and allied sectors. Infrastructure is, in fact, one of the fastest growing fields in India today. The booming economy is a result of improved infrastructure in all spheres of industrialization. AIIE is committed to creating the next generation of engineers, managers and leaders in the infrastructure and allied sector. As per AICTE / GTU norms. 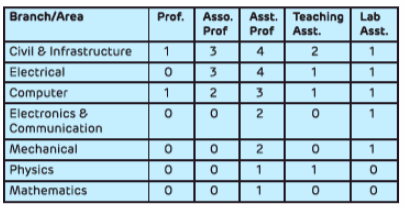 Ph.D and teaching / research credentials are preferred. How to Apply: Interested and eligible candidates are requested to send application with CV, copies of certificates and recent passport size photo to the email address provided below or apply online.